Eye Movement Desensitization and Reprocessing (EMDR) can be an extremely effective and efficient way to treat trauma and other issues that individuals need to resolve. It can be utilized to treat phobias, anxiety, depression and it's a great way to help people build confidence and enhance performance. EMDR often takes less time than other forms of therapy. 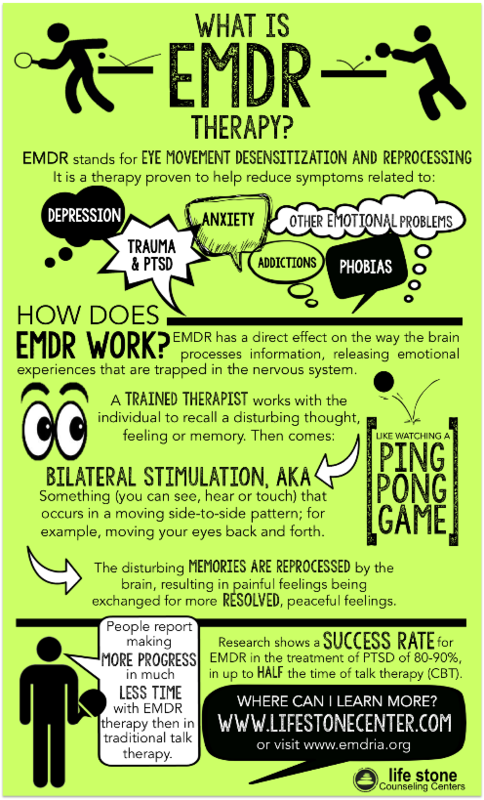 Most notable about EMDR is that it helps the brain to tap into its own ability to self-heal without having to rehash all the details of a traumatic event. Life Stone Counseling is a nationally recognized center for EMDR therapy. In fact, we draw clinicians nationally for advanced EMDR training and consultation. Our clinicians also present nationally and internationally at EMDR conferences and other events. We are proud to be on the cutting edge with this, extensively researched, integrative psychotherapy approach that is proving to help individuals enhance their quality of life in much less time than traditional talk therapy. - Better After Trauma Than Before It? For Many, It's True!